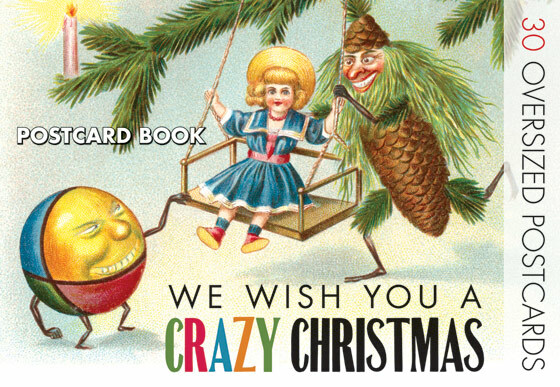 The images in We Wish You A Crazy Christmas were chosen from our vast collection of Victorian and Edwardian Christmas cards and postcards. The images in We Wish You A Crazy Christmas were chosen from our vast collection of Victorian and Edwardian Christmas cards and postcards. The end of the 19th and the early 20th century was a rich time for postcard publishing. Millions of postcards were produced, sent and enjoyed. Almost every subject was explored, holidays of course being a favorite occasion on which to mail a card, and Christmas prime among those holidays. Most had traditional or religious imagery, but a substantial minority were to our minds strange or incongruous, such as cow in a field, a tree blossoming in spring, a sandy beach. A smaller number goes beyond irrelevancy to weirdness, and these we have decided to share with our adventurous customers. They offer the opportunity to ponder, laugh, or to simply wonder, Why?